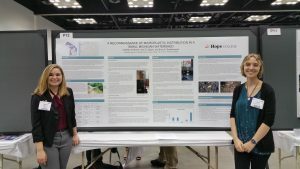 A research presentation by two Hope College students won a first-place award during the recent annual national meeting of the Geological Society of America. Juniors Chelsea Moore of Muskegon and Amy Olgers of Holland were honored for their poster presentation of their research project “Reconnaissance of Microplastic Distribution in a Small Michigan Watershed,” which they conducted collaboratively this past summer with faculty member Dr. Brian Bodenbender. They were chosen for the recognition in the Environmental and Engineering Geology Division out of a field of 24 entries that included graduate students as well as undergraduates.